Hey Nick, thank you - again - for this unexpected surprise - wonderful music! Recorded 1st & 4th December 1969 in the Netherlands. Excellent -- Mr. Loevendie's jazz stuff, if you pardon the expression, doesn't seem easy to find! This album isn't that rare. Has been reissued in 2009 by the Music Center The Netherlands, together with The Consort second album "Chess!". Marvellous music indeed. 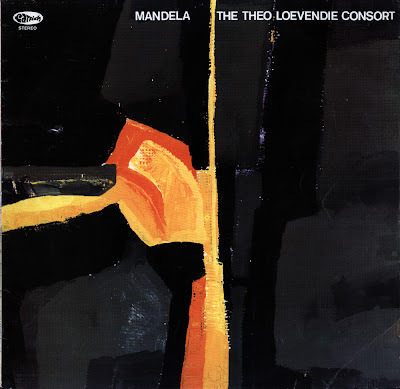 Has someone a real rarity - "The Theo Loevendie Three - Stairs"? Eternal gratitude will be his/her share. New name to me, many thanks. As I won't post anything in IS which is available I shall delete the link. Thanks, Reza, for your reaction. Bozo is mad, the site mentioned that reissued this classic twin-billeted cd has not responded to the Clown's inquiry. My copy is not as pristine as it could be from constant taping over the decades! Thrilled to see the intrest in the smokin' jazz side of the noterd composer - he and Candy;s dad made a great frontline -[see "Orlando"] and Mandela is a groovy alternate Dutch universe to the ICP axis. Bozo bets that in Holland there are some buzzed-out tapers who have tons of mouth-watering live shows sharing closet space with their old hash-pipes. @ Bozo - You could try it again. I try to get some CDs from them for the shop I'm working for - and I have got a reply some weeks ago - today Ihave tried to fix it - we'll see. Stairs! is a great record - I'm surprised people here don't dig it. It is obviously not as "formed" or "polished" as the Consort work or Loevendie's great quartet with Hans Dulfer, but it's still important contextually and musically fascinating. Horses for courses, but honestly Stairs! is worth a revisit. Not sure why this came up in this thread, Clifford, but most comments liked Stairs! Does anyone have a link where to buy the Mandela/Chess CD release? I have tried to locate it - to no avail. It seems to have been available "somewhere" for maybe 5 min. But maybe I'm wrong. Any help would be appreciated. There is an offer from March 2014 > 4,- euro! I did this several times - contacting the musicians - and often got the recordings I was looking for. Even sometimes LPs from the 1970-80s. Thanks, onxidlib. I'm giving the keepswinging a try. I'll keep my fingers crossed that I'll get a reply that will work for purchases from the US. A "bankoverschrijving" will cost me plenty in fees and doesn't seem to be practical for folks outside of NL (or the EU). I'll keep you posted. Thanks! Here is an update regarding the emails contacts that Onxidlib posted some years ago. the cd version contains both lp "mandela" and "chess". Copies are still available at this address but for how long?